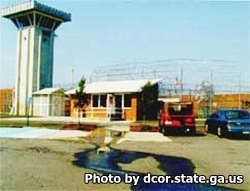 Telfair State Prison is located in Helena Georgia. It is a closed custody facility that houses approximately 1,400 adult males. General population inmates can be housed in either an open dormitory, or one of five units that uses double bunked cells. If an inmate is in segregation they can be housed in either single cell isolation or in a double bunked cell. Segregation is for inmates who either are difficult to manage, or have safety and security concerns. Offenders at Telfair State Prison can earn a GED, and adult basic education. They can also receive counseling for substance abuse, family violence, deviant sexual behavior, and re-entry. Vocational skills that inmates can participate in at this facility include maintenance, custodial, landscaping, computers, clerical, automotive repair, baking and food preparation. Visiting is 9am-3pm on Saturdays, Sundays, and State recognized Holidays.